It is a general consensus in the medical field that men with more than 25% body fat and woman with more that 30% body fat are considered obese. Exactly measuring is much more complex as it is difficult to precisely measure the amount of body fat. Though there are many methods available for measuring body fat, the ‘body mass index or BMI is thought to be the medical standard. This system is basically a height to weight ratio system of measurement used to measure both genders. This is not a precise way of measuring as heavily muscled bodies will incorrectly fall into the overweight or obese category due to the fact that lean muscle actually weighs more than body fat. If you would like to measure your own BMI, you would take your weight in kilograms by your height in meters squared. If you would like to figure it in inches, you would multiply your weight in pounds by 704.5, then divide the results by your height in inches, then divide that result by your height in inches once again. 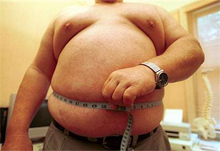 A BMI of 25 to 29.9 indicates a person overweight, 30 or more indicates obesity. Where Does Your Body Carry Fat? How much fat you carry is only one of the health risk issues, where you carry that fat is a whole different health risk issue. If you carry your weight evenly distributed about your body, your health risks are much less than if you tend to carry that weight around your waist. You are more likely to develop health problems directly related to obesity if your weight is centralized around your waist. Women whose waists measure 35 inches or more and men with a measurement of 40 inches or more have higher health risks due to the distribution ratio of their fat cells. The most accurate technologies currently available for measuring body fat is to weigh a person underwater, or use an x-ray called a ‘Dual Energy X-ray Absorptiometry or DEXA. These methods are very expensive and not a practical solution for the average person, especially those dealing with stubborn weight. These tests are generally only performed in research situations with specialized equipment under controlled conditions and are specifically connected to or a part of another research project. Your body will tell you how you’re doing, if you’re overweight, you will find you may tire easily, your body, especially your extremities will ache, you may find that your lower legs, ankles and even feet swell. You may notice foot pain due to arch problems. There are many ways your body can tell you that you are overweight. There are generally accepted weight for height ratios for the ‘average’ person, but don’t measure your weight program by that. It’s a good idea to talk to your doctor and consult with a nutritionalist on your diet. You should never start a diet program without consulting with your doctor and getting a diet program worked out that works with your health conditions. How much weight you carry is not as important as how healthy your weight loss program is.